Oswego Children’s Theater Latest production “Disney’s 101 Dalmatians Kids” is set to open July 17 for a weekend run. The show is based on the 1956 novel by Dodie Smith, which tells the tale of a pair of Dalmatians, Pongo and Perdita, who have just produced a litter of 15 puppies. Then the monstrous Cruella DeVille plots to steal the puppies to make a spotted, dog skin coat. Oswego Children’s Theater’s ” Disney’s 101 Dalmatians Kids” opens July 17 and runs through July 19, at the New Haven Congregational Church. Trying on costumes are cast members Mason Arnesen, Mark Shelmidine, Madeline Loomis, Karlee Nabinger, Nolan Conners, Jacquelyn Livingston, Robin Sacco, Rosa Sacco, Maya Loomis, Bethany Sanford, Donavin Powless , Adiss Livesey Ferry, Peyton Frey, Braden Livesey, Chloe Nabinger, Caroline Gray, Racheal Roper, and Astrid Livesey. The adventure continues as the pair and their human “pets” Roger and Anita, and all the dogs of London join in the search and rescue of the kidnapped puppies. All’s well that ends well as the puppies are found and Cruella and her bumbling henchmen get their just desserts. The show features a cast of about 20 area youth ranging in age from 14 months to 18 years that comes from all over the area including the city and town of Oswego, Mexico, Scriba, New Haven, Pulaski and Sandy Creek; including Mason Arnesen and Madeline Loomis, as Pongo and Perdita, Braden Livesey and Caroline Gray, as Roger and Anita, and Robin Sacco as Cruella DeVille. Other featured players include Nathen Frey and Astrid Livesey as the evil Henchmen, Horace and Jasper, and Jaquelyn Livingston, as Nanny. The Dalmatian puppies are played by Mia Corradino, Nolan Conners, Audrey Donavan, Adiss Livesey-Ferry, Payton Frey, Amaiya Heppell, Maya Loomis, Karlee Narbinger, Donavin Powless, Maya Roper, Rachel Roper, Rosa Sacco and Bethany Sanford. In addition most of the puppies are double cast as other dogs including Chihuahuas, Scotch Terriers, Boxers, and Poodles. The narrators include Chole Nabinger, Jaquelyn Livingston and Mark Shelmidine who also plays Sergeant Tibbs. Disney’s 101 Dalmatians Kids” is directed by Wayne and Kelly Mosher and assistants Gary Smith and Jessica Johnston, who lead a production with a bright, happy, score colorful costumes and an easily followed story that is sure to enchant audiences of kids and grownups alike. The story was adapted for the stage by Marcy Heisler , with music by Brian Smith, Dan Root, Martin Lee Fuller, Mel Leven, Randy Rogel, and Richard Gibbs; Lyrics by Marcy Heisler, Brian Smith, Dan Root, Martin Lee Fuller, Mel Leven, Randy Rogel, and Richard Gibbs; and the music for the show was adapted by Bryan Louiselle. Disney’s 101 Dalmatians Kids is presented by special arrangement with Music Theatre International. 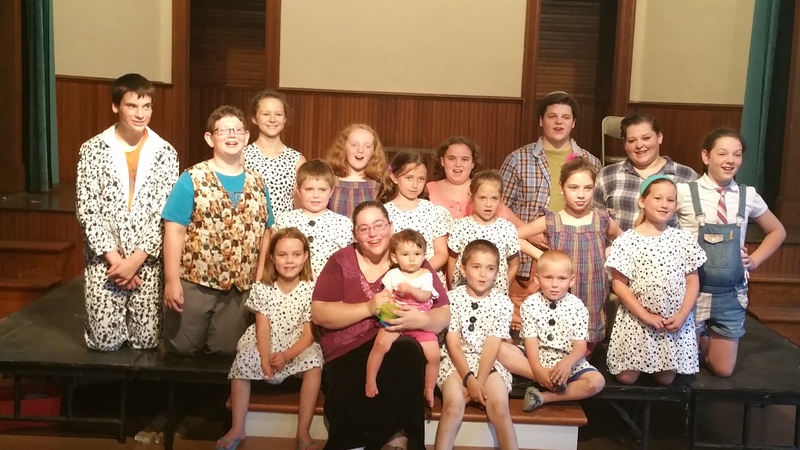 The production is slated to be performed on July 17 at 7:30 p.m., July 18 at 2 p.m. and 7:30 p.m. and July 19 at p.m. in the theater performance space at the New Haven Congregational Church located on Route 104 East between Oswego and Mexico. Tickets for the show are $10 for adults, $8 for seniors and $5 for students. For reservations and more information call 315-342-5265. For more information call 342-5265 or 529-1009.